In response to Avea Nsoh’s ridiculous claims of innocence, I wrote an article providing readers with 7 of the 19 charges that have been leveled against him, copies of which he has been duly served. Only a classic, pathological liar could attempt to claim innocence in such glaring cases. 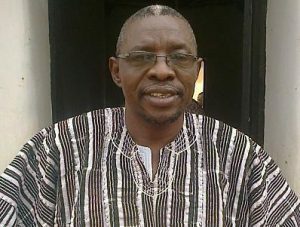 Only the likes of Avea Nsoh are able to point accusing fingers at everybody- His Excellency, the President of the Republic, the Honorable Minister of Education, the Metropolitan Archbishop of Cape Coast, the MP for Effutu, the Chairman of the Governing Council of UEW, the entire UEW Governing Council, the Paramount Chief of the Effutu Traditional Area, and member of UEW Governing Council, Neenyi Ghartey VII, the Vice-Chancellor (VC) of UEW etc etc. Those who know the man Avea are fully convinced that he is mentally ill and needs prompt help. Indeed, it is for the sake of the general public who may not know him, and are always hearing and reading his baseless rantings and roarings on radio, TV and journals (under pseudo names, as is usual trait), that this article is being written. 1. Avea Nsoh was the leader of a group that announced and succeeded in bringing about the temporary closure of the University of Education, Winneba (UEW) in July, 2017, an admission he himself boldly made during a meeting with the Minister of State responsible for Tertiary Education, with representation from UEW Management, Deans, Deputy Registrars and the then local UTAG Executives at the UEW Council Chamber. How a College Principal could be so reckless with his own University beats the imagination of the reasonable person! 2. Again in July, 2017, Avea Nsoh organized a ‘Talk’ at the UEW South Campus, and proceeded to invite external media without recourse to UEW Management’s approval, and without any reasonable basis, publicly attacked UEW Management (of which he is part!) and the University with several wicked insinuations and maligning. The issues he ignorantly raised in that illegal “Press Release” were at that time pending before the Winneba High Court, and he and the University could have been cited for contempt- if a formal report had been made to the court. Why would a College Principal and Associate Professor, deliberately drag the name of his own University into disrepute? 3. Avea Nsoh refused to submit his Deans’ recommendations for Headships and other departmental appointments for the new academic year (2018/19) to the Vice-Chancellor and at the same time, in an attempt to cause disaffection for the VC, created the impression to the Deans that the VC had disregarded their inputs! Why would a College Principal set out to create chaos in his own University? 4. As College Principal, Avea Nsoh absented himself from a University-wide-Student-Staff Consultative Committee Meeting without any permission or prior notification when indeed he had been asked to make a Presentation on his College at the said meeting! Did this Associate Professor for once think about the huge administrative implications of such misbehaviour? 5. Avea Nsoh, without permission, simply refused to attend the 2018/19 Sandwich Matriculation at the Winneba Campus, even though his students were present to be matriculated! Where in this world would such irresponsible behaviour be entertained? 6. Avea Nsoh has been consistent in his disrespect for the VC, and at one Appointments and Promotion Board (APB) Meeting, referred to the latter’s views as “nonesense”. It was only after the entire Board demanded a withdrawal and apology that he grudgingly did so! 7. As if his gross disrespect was not grave enough, Avea Nsoh, repeated this insane behaviour at another meeting only the following week; and this time, was made to walk out of the UEW Council Chamber! Is there any civilised institution that will countenance such consistent incomprehensible misbehaviour of a staff, not to talk of a Management member? These are some of the charges leveled against Avea Nsoh, who pretends that he is not even aware of any misbehaviour. This man is either too insane to realise the harm that he has caused UEW or just too callous and simply wants the University’s name and reputation dragged in the mud. This is Ephraim Avea Nsoh, partly exposed! More to come, so stay tuned!! The author has authored 78 publications on Modern Ghana. Disclaimer: "The views/contents expressed in this article are the sole responsibility of Alhassan Salifu Bawah and do not neccessarily reflect those of Modern Ghana. Modern Ghana will not be responsible or liable for any inaccurate or incorrect statements contained in this article." Are Akans in Ghana Asleep or What?